A strike on an airbase near Damascus blamed on Israel killed high-ranking Syrian officials, activists there said Friday, according to a Saudi report. Activists quoted by the al-Arabiya news outlet said several high-ranking officials in the regime of Syrian president Bashar Assad were killed in the bombing on the military airport to the southwest of Damascus. There was no confirmation of the reports. The Syrian state-run Sana news agency blamed the explosions that rocked the airport early Friday morning on Israeli missiles, and reported a fire, but no injuries. The regime source also threatened “repercussions” against Israel over the “flagrant” strikes. Several local media outlets reported ambulances were dispatched to the scene. The Lebanese al-Meyadeen news outlet reported that the strike targeted a weapons depot at the strategic base, wounding four soldiers. Mazzeh is located near Assad’s presidential palace and has been used by troops and elite forces to shell rebel-held areas during the country’s civil war. The report of Israeli military action was the first in over a month. The last incident also involved an attack on the Mazzeh airbase. 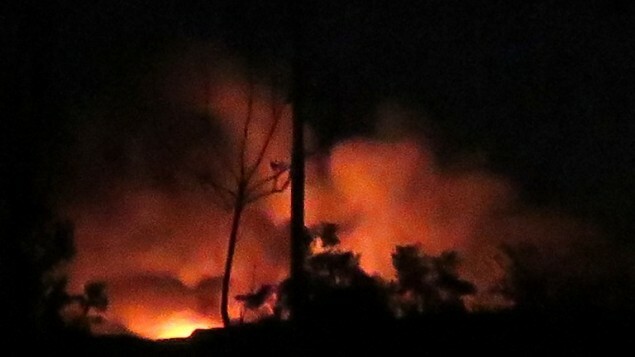 In early December Syrian state media reported that the IDF fired missiles from within “occupied” territory at an important Syrian regime airbase outside Damascus. The IDF, which doesn’t comment on foreign reports of military operations, refused to confirm the reports. Videos posted online purporting to show Friday’s attack showed several massive fires, with sirens wailing in the background. Officials in Jerusalem have said they take action to stop the transfer of advanced weapons to terror groups; over a dozen strikes inside Syria have been attributed to Israel. Judah Ari Gross and AFP contributed to this report.